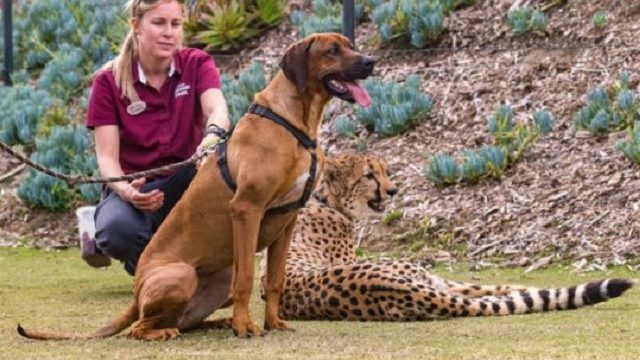 A Rhodesian ridgeback named Raina and a cheetah named Ruuxa are constant companions, according to zoo officials. In 2014, a male cheetah cub named Ruuxa was recovering from surgery at the San Diego Zoo Safari Park to repair a growth abnormality that caused his legs to bow. While in the zoo’s veterinary hospital Ruuxa was accompanied by Raina, a female Rhodesian ridgeback puppy who sat beside him as he came out from under the effect of anesthesia. Fast forward nearly four years, and Ruuxa and Raina are still getting along famously. 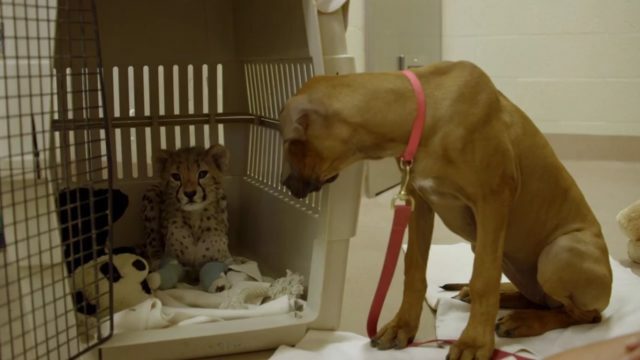 The cheetah and pooch have been constant companions since they were paired together at four and five weeks of age, respectively. Cheetahs in zoo settings are frequently paired with dogs for play and companionship, according to zoo officials. This buddy system, now used in zoos across the country, was created at the San Diego Zoo, officials said. Zookeepers say Ruuxa, who was born at the San Diego Zoo Safari Park’s Cheetah Breeding Center, and Raina are one of their most closely bonded pairs. But the first cheetah-dog pair to buddy up was a male cheetah named Arusha and a golden retriever named Anna, in 1980. Beginning with their pairing by zookeepers, it became obvious that dogs have a positive effect on some of the fleet-footed cats. Cheetahs are generally peaceful among themselves, except when males occasionally fight over females in the wild, and easily get along with their canine counterparts, according to zoo officials. 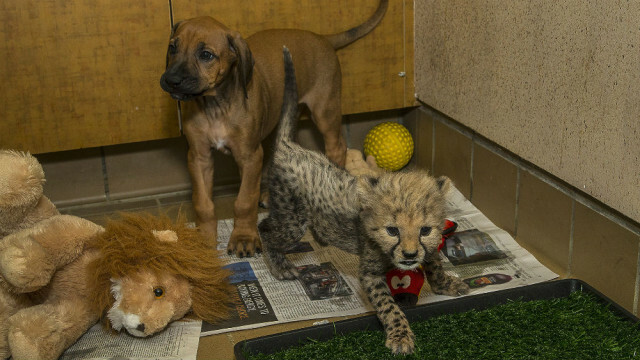 Dogs and cheetahs are introduced as puppies and cubs. It takes fewer than three months for them to get comfortable enough to play together all day and nestle against one another at night. In fact, they do everything together except eat, officials explained. Cheetahs and dogs also have a symbiotic relationship in their native habitat. At press time, three dogs are paired with five cheetahs at the San Diego Zoo, and five dogs are paired with six cheetahs at the Safari Park.